It’s almost Valentine’s Day, and you know what that means… chocolate (okay, and maybe some love, too). 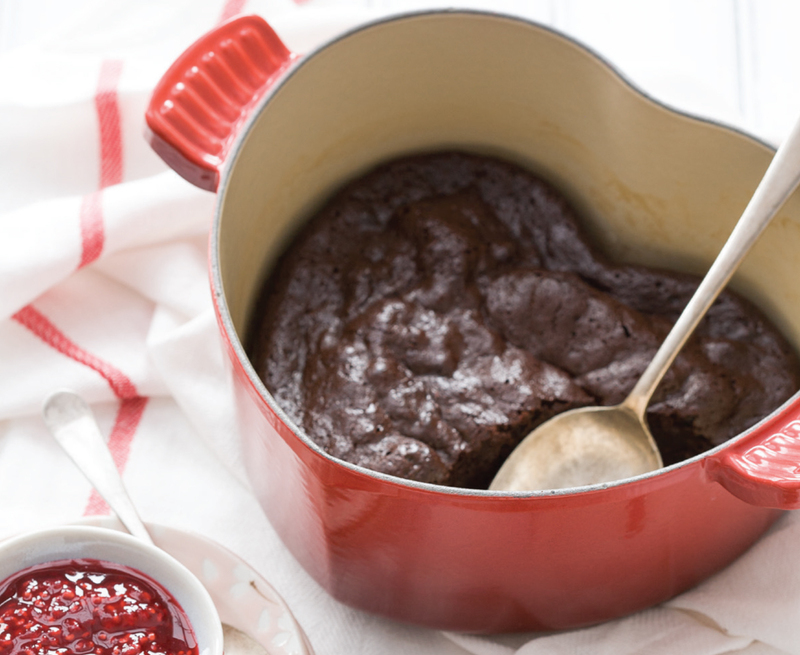 Nothing – nothing – says romance like rich, indulgent chocolate cake, and this flourless version with raspberry port sauce from Le Creuset is sure to cause more than a few skipped heartbeats. Bonus points if you whip up this cake in Le Creuset’s festive Heart Cocotte, because we’re nothing if not suckers for a theme. Serve warm, with ice cream or whipped cream, and get ready for a major heart bake. Generously butter the bottom and sides of the Heart Cocotte. Combine chocolate and butter in a double boiler or a heatproof bowl set over a pot of gently simmering water. Stir until melted and smooth. Remove from heat and whisk in sugar. Add eggs, one at a time, whisking well after each addition. Add cocoa powder, espresso powder, and salt, whisking until just combined. Stir in vanilla. Pour batter into Heart Cocotte. Bake for 30 minutes or until a toothpick inserted near the center comes out with a few moist crumbs attached. Transfer to a rack and let cool for 5 to 10 minutes before serving (cake will sink slightly). Combine raspberries, sugar, and port wine in a small saucepan. Bring to a simmer and cook, stirring occasionally until berries break down and sauce has thickened, about 15 minutes. Use as is, or strain through a fine mesh sieve for a smoother texture. Drizzle over cake and serve with a heaping scoop of vanilla ice cream or whipped cream, if desired.